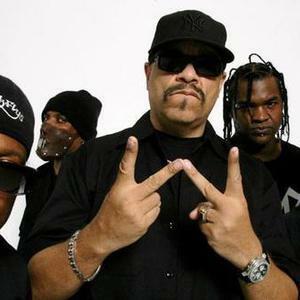 Body Count is a crossover thrash band from the United States, best known for being fronted by Ice-T and causing a furor with the release of "Cop Killer" from their debut album, Body Count. Besides Ice-T, Body Count included Ernie-C (lead guitar), Mooseman (bass), Beatmaster V (drums) and D-Roc (rhythm guitar). Their album attacked, in graphic terms, various aspects of racism and criminality in South Central Los Angeles (now South Los Angeles), including corrupt police officers. A few months after Body Count was released, parent groups and other advocates began protesting "Cop Killer". Besides Ice-T, Body Count included Ernie-C (lead guitar), Mooseman (bass), Beatmaster V (drums) and D-Roc (rhythm guitar). Their album attacked, in graphic terms, various aspects of racism and criminality in South Central Los Angeles (now South Los Angeles), including corrupt police officers. A few months after Body Count was released, parent groups and other advocates began protesting "Cop Killer". After months of intense pressure, Warner Brothers took the song off the album (replacing it with a bland version of Ice-T's - 'Freedom of Speech'). Ice T would leave the company soon after. Priority Records released Body Count's follow-up, Born Dead which continued on in a simular vein from the debut, the album would also include a cover of Jimi Hendrix's Hey Joe but sales were low, and Mooseman left the group and was replaced by Griz. Body Count's third album Violent Demise: Last Days (1997) received better reviews than their previous efforts, but sales remained low. The band soon began to unravel, Griz left the band soon after the release of Violent Demise, Beatmaster V died of Leukemia, Mooseman was shot in a drive-by in winter 2000 while working for Iggy Pop and in late 2004 D-Roc died due to complications from lymphoma, leaving only Ice-T and Ernie-C from the original Body Count line-up. Murder 4 Hire: Will Kill For Money is Body Count's follow-up record. It was realeased August 1, 2006. On August 3, 2006, "You Don't Know Me (Pain)" was performed on Late Night with Conan O'Brien. The lyrics were slightly modified to mention the host of the show, Conan O'Brien, after he had jokingly requested that Ice-T include a "shout-out" to him in one of his songs.